I talked to two Scandinavian open source guys recently and I asked one of them, a Linux and Asterisk geek, whether he thinks the Asus Eee PC will help introduce Linux to mainstream computer users. His answer: absolutely! For many in the newsroom, the Eee PC is their first encounter with Linux. I have been repeatedly promoting open source, including Linux, among my colleagues. Still, I was apprehensive on how they’ll take to the version of Xandros that runs on the Eee PC by default. INSTALLING JEDIT. 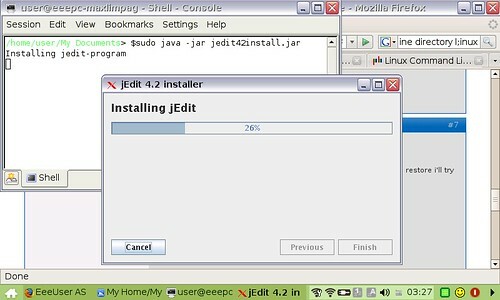 Installing JEdit on the Asus Eee PC for some code work. Click on photo to enlarge. My newsroom cubicle neighbor was a cause for particular concern (needless it turned out later) because among his questions to me when I talked about the difference between the Eee PC and a regular desktop was: what’s an operating system? But a day later, he had upgraded his Skype installation to enable video chat support. That’s how easy the Asus Eee PC “Easy Mode” is to use. The Eee PC costs less than a high-end cellphone but is worth more. It’s so small and light it feels as if it doesn’t add anything to your luggage. The MSI S260 I use is small and yet, after a while, I get tired of lugging it around with me all the time. Since it uses a solid state drive, it boots up quickly. This and its size make using the Eee PC to write notes for articles such a convenience. I still haven’t asked the reporters who bought the Eee PC for feedback on their use of it but I’m sure the experience will be a positive one. I’ve used the Eee PC to work on several articles (this blog post among them) in blocks of free time I have in the newsroom. EEE PC SHIPMENT. 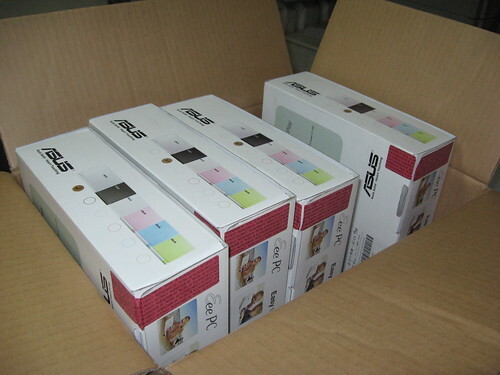 One of the boxes of Asus Eee PC units for Sun.Star Cebu editors and reporters. Click on photo to enlarge. 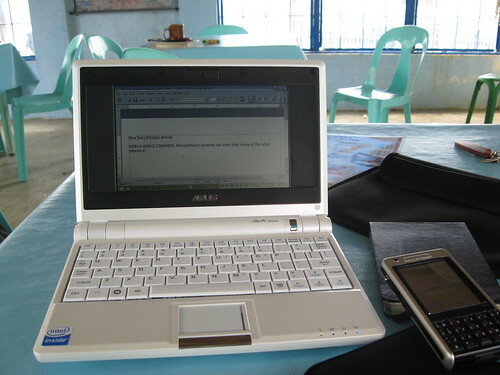 I’ve used the Eee PC to continue writing, send and check on e-mails, monitor the websites I’m running, upload photos for blog articles, and write a blog post even during a trip to the far-flung town of Argao in southern Cebu. Every once in a while I’d turn it on to continue working on an article when my wife and the kids are busy checking out the Spanish architecture you still see in the town up to this day. Argao, which I’ll write about later, offers free Wi-Fi access in the town plaza. It was deployed last year by the municipal government. The Asus Eee PC also picks up Wi-Fi signals well, better than my MSI S260. I haven’t checked but maybe it’s using a better chip. A signal that’s only, say, 70 percent in my MSI S260 is picked up in the 80 percent plus range in the Asus Eee PC. The first time I used the Eee PC, I promptly checked on the popular EeeUser website, whose forum and wiki provide a lot of tips for users of the device. 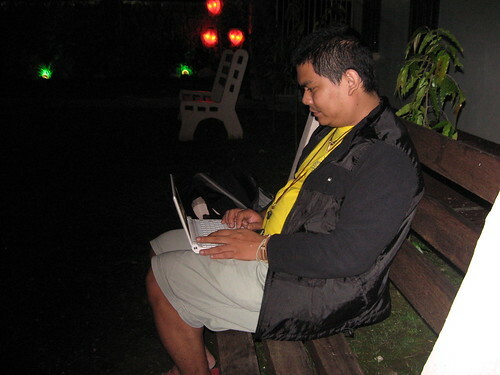 I also checked on J. Angelo Racoma‘s Asus Eee PC journal, which has a lot of great articles on the gadget. I initially thought of using the full desktop or advance mode but chose to stick to the easy mode for at least several weeks. The only application I’ve added is JEdit for some code work. I checked around for instructions on installing Bluefish but couldn’t find any so I installed JEdit using the instructions here. I also installed SublimePorte’s launcher editor to edit the icons and add more launchers. I’m thinking of adding Gimp later to edit photos for blog and website articles. My first few days with the Asus Eee PC have been awesome. It truly is a writer’s notebook, or sub-notebook if you’re technical about it. I was planning to get one. Globe has a new offer right now featuring that Asus Eee Pc. But, I can’ t subscribe to it since I have an existing account with them already. I was just amazed on the gadget itself since I want to update my blog from time to time. Thats true Max, Its really a writers gadget.